The Sony PCM-D1 is noticeably larger and heavier than its competitors, but it still fits in the palm of your hand. Everything about it, from the titanium body to the stainless steel bent rods protecting the XY-configured microphones, says "I am a seriously cool piece of professional audio equipment." The body even has a threaded hole for easy tripod mounting. It comes with a very good padded carrying case, a windscreen, a usb cable, an AC adapter, 4 rechargeable batteries with battery charger, a cd-rom with Digion Express editing software, and a user manual. It's easy and intuitive to use. The manual is short and almost unnecessary. 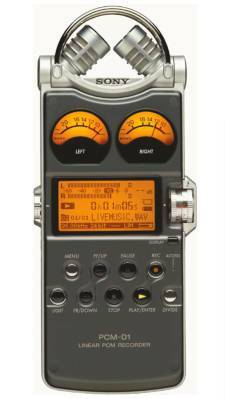 The orange screen with black lettering is the largest of the handheld recorders reviewed and is easy to see. Favorite feature: You can easily divide tracks during recording and playback with the "divide" button on the front of the unit. No digging through file menus to find the divide function. DURABILITY UPDATE: Here's a True PCM-D1 Story: While I was setting up to make choral samples, an instrumentalist colleague inadvertently backed into my row of recorders and knocked the PCM-D1 from a height of about 3-4 feet onto the terrazzo floor of the church. Distraught, I picked up the recorder to assess the damage and discovered that...nothing happened. No dents, no scratches, no nothing. Really. The impact had popped open the battery drawer, but after I pushed it back in, the power came on immediately. I resumed recording and the result is the choral sample you can hear on this site. Such is the power of titanium and outstanding build quality! 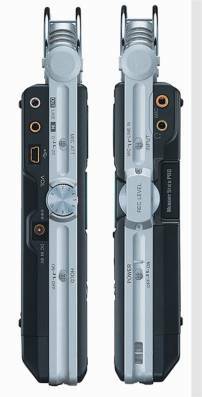 With its Limiter function turned on, the Sony PCM-D1 constantly reserves an audio track 20 dB lower than the audio being processed in its normal circuit. This means that if there is a sudden loud sound, the recorder will automatically lower the excess part of the sound to be within the range of your maximum input level. Of course, it's not a guarantee that your recordings will never be distorted, but this feature alone could save a lot of time and be a deal maker for many. Excellent. The built-in microphones are extremely sensitive. In fact, the Sony PCM-D1 sound samples might sound a bit harsh compared to the others. I think this may be due to our ears being accustomed to the "colored" sound of the more accessibly priced recorders. The high accuracy and detail of this unit's sound can be an acquired taste. Once you've acquired it though, there's no going back. Good. The PCM-D1 lasted approximately 4 hours during our recent battery life test. Of course, you may achieve different results. The Sony PCM-D1 comes with 4GB of built-in CF storage. If you need more space, you can add Sony's proprietary memory stick PRO media in the slot provided. I haven't needed the extra storage yet. The usb 2.0 connection is quick and responsive. 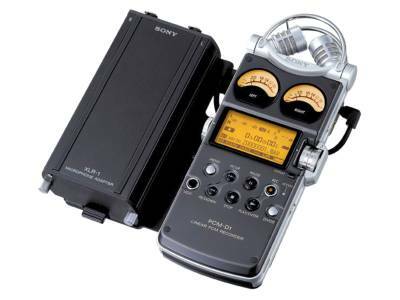 With a usb mini port, 1/8" mic, line and headphone inputs and a 1/8" digital output, the Sony PCM-D1 is a little skimpy on the connections. You can, however, use external mics with balanced XLR connections by connecting the PCM-D1 to the optional XLR-1 adapter. 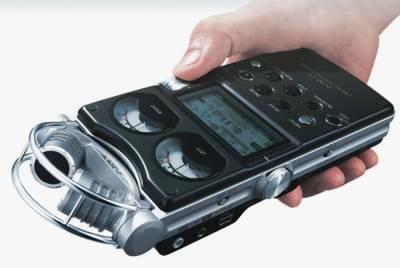 The Sony PCM-D1 is an easy-to-use, great-sounding, extremely well-built recording device. If you can afford it, buy it.